I gotta say…I’m fooded out. I’m Americana turkeyed and hammed and stuffed out. I’m trimmed and treed and cooked the f out. "OOoOoOooOohh baaabeee…I have a fooooood hangover…"
When this happens, I usually turn to ethnic food. You’ll sporadically hear about my night sweats thinking about soup dumplings from Chef Liu’s. Maybe its pho from Viet Chateau. For the moment, I’m so Spoonin’ it ain’t funny. Spoon is the new Thai place in the (even more) blossoming (than it was before) Westside district of the ATL. I happened upon their website about a month ago and gave it a whirl. 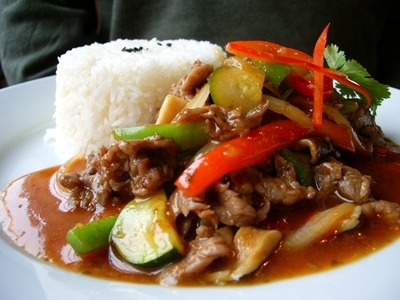 Its my favorite Thai food in Atlanta right now..and that’s saying a lot. I’ve eaten lunch there two days in a row – everything I’ve had was top notch. If I didn’t have a shoot tomorrow, I’d be trying the Masaman at lunch tomorrow. It’s that good. 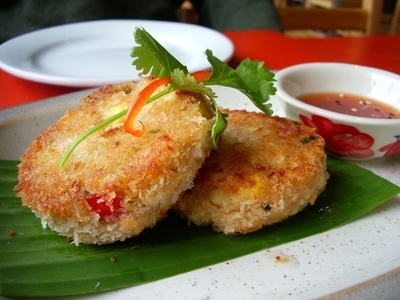 The tofu corn cakes (pictured above) are out of this world. Imagine a veggie Thai "crab cake". Flavorful and delicate but all of the tastes hold their own. I could eat an order of six of these and be perfectly happy. My friend Alex, whom I met for lunch today and is the person you seem looming & waiting for me to get done taking photos of his food, had the "three flavored chili beef". It looked great and smelled great. I was so wrapped up in taking photos and devouring my food that I forgot to taste it. Oops. 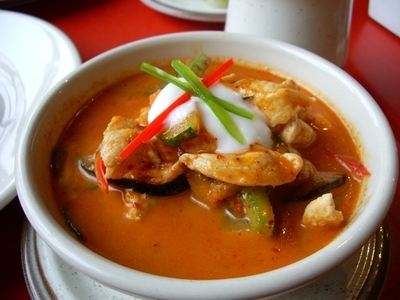 My choice today was the Penang curry with chicken. I am not a fan of overly spicy Penang. I would rather have a creamier, coconut-ier version where the curry flavors shine through than something that is too spicy to let the mellow, simmered flavors come through. This was perfect. Great flavor, nice veggies, and enough chicken to make it hearty. Note the oozy, gooey wonderful blob of coconut milk on top. Swoon-worthy. Spoon has a website. Not only should you visit their site (and from a photography standpoint, they get an A+…especially being a new restaurant). They are open all day and are BYOB until they get their booze on. Go and support a great place on the Westside. Now.